Process the bell pepper, onion, 1 cup orange juice, scallions, garlic, chiles, lime juice, cumin, coriander, sazón, and 1 teaspoon salt in a blender until smooth. Reserve 1 cup of the marinade. Place the pork shoulder and belly in a gallon-size ziplock plastic bag and add the remaining marinade. Seal and place in refrigerator; marinate for at least 2 hours and preferably 24. 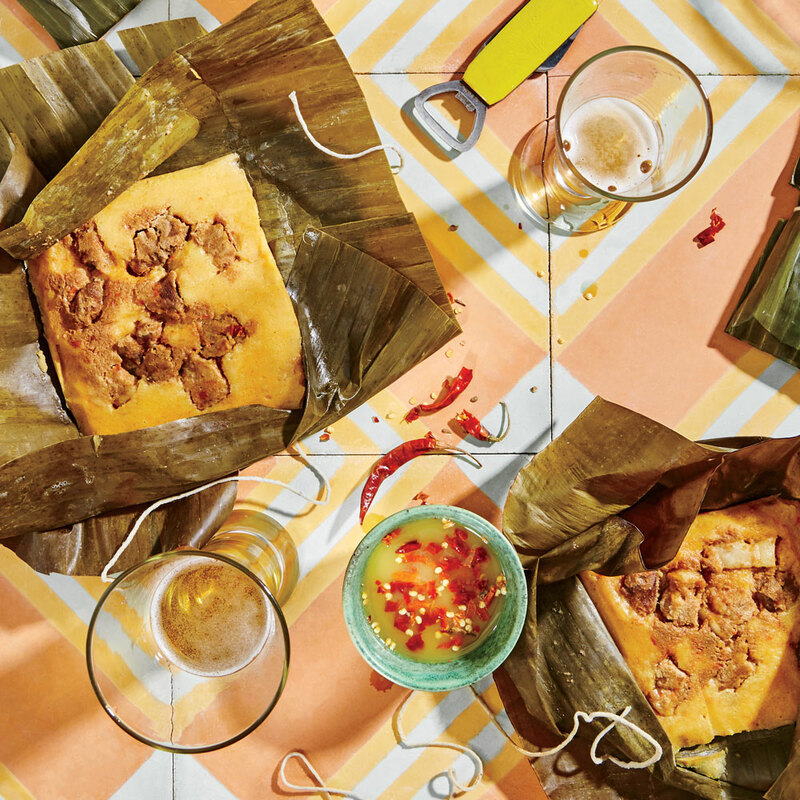 When ready to assemble the tamales, in a large bowl, stir together the masarepa, reserved 1 cup marinade, remaining 2 teaspoons salt, and 4 cups warm water to form a spreadable, smooth dough. Add more water by 1/4 cupfuls if dough is too stiff. Wipe the leaves with a damp towel to remove any dirt. Lay 1 banana leaf piece on a work surface, shiny side down and ribs running horizontally, and lay a second piece on top, shiny side down and ribs running vertically. Spread about 3/4 cup of tamale dough in center in a 5-inch square. Top with 1/4 cup marinated pork. Fold the top leaf over the dough and meat to enclose, then fold the bottom leaf around the packet to fortify. Secure the packet with kitchen twine (I like to tie them like gift ribbon), then place in a large steamer basket. Repeat with remaining banana leaves, tamale dough, and meat. Set the steamer basket over a pot of boiling water. Cover and steam until pork filling is rendered and cooked through and masa is firm, about 1 hour and 30 minutes. Let stand 15 minutes before serving. Stir together the remaining 1/2 cup orange juice, crushed red pepper, and a pinch of salt. Serve sauce with tamales. Узнайте про нужный портал с информацией про Купить Meizu M5.